I've often been asked, how did you get that shot? 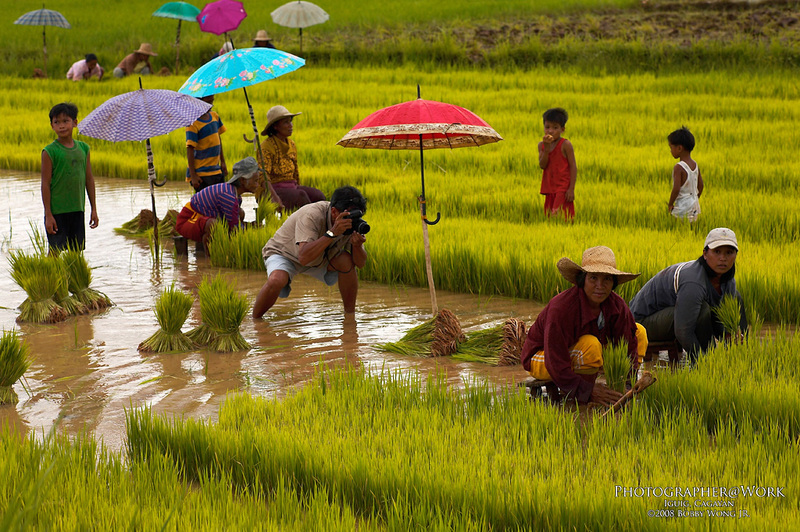 It was July, the start of the planting season for rice, in the municipality of Iguig in Cagayan. Parked by the side of the road, we had our eyes on some brightly colored umbrellas further off. The fields around us had been fallowed and filled with water. As the women harvested rice seedlings from nursery plots, the men hauled them away to plant. It was "bayanihan" at work, a merry sight if you've seen one. But sometimes, getting close enough to take a shot meant navigating narrow dikes with expensive gear in hand. And splatter mud all over our shoes? As this photograph showed, those who got close enough took home defining images. But those of us who took off their shoes and socks got shots none of us brought home. Truly, sometimes you just have to get closer. Would you have taken your socks off? Enjoy. Bobby, I'd rather wade in the water with socks on, than barefoot. Wash 'em later and bring more pair of socks for later shoots. I wonder if there are long rubber socks in the market, hehe. Thanks for sharing this beautiful, significant photo. Without rice, no Filipino would be happy. My fav here in Weatherford, TX is Jasmine rice. No Pinoy rice available yet. hmm...you made me think. i mind mud icky hehehehe! but for that shot, i'd go wade without the socks. Nice shot! You are a genius with these shots. Your blog rocks. Uh, no thanks. If I had my rain boots, then yes. I'm intrigued by the umbrellas on the sticks. Do the women move them as they work? Another great shot from a great photographer. Thanks for sharing them with us. From Jun of Union City, California. Are these authentic umbreallas? They are too pretty - like a parade. These umbrellas seemed too pretty! Are these aunthetic or were these placed there for this shoot. Colorful idea - you are a genius photographer. Hi Everyone thanks for coming by. Regarding the colorful umbrellas, yes they belong to the farmers. As they move around the fields harvesting the seedlings, they move them umbrellas around with them. Yes they are a sight to behold, that's how we spotted them from a distance!